It’s been another long week for Gabby, between visits to the Emergency Room, more hair loss, getting sick, and the daily trek to radiation treatments she still manages to shine day after day. Gabby is sedated every radiation treatment. Yesterday she asked me what happens when she goes to sleep. All I could do was try to hold back the tears and say they take pictures and give her medicine to get rid of the yuckies. How do you explain radiation to a five year old? Last Friday morning we headed to radiation and came back home at11:00. Apparently CHOP started a radio show in the lobby and we didn’t know. Friday morning Selena Gomez, Ryan Seacrest and supposedly Justin Bieber were there. We didn’t know…. Gabby missed rubbing elbows with Tiger Beats cream of the crop, but went home and had a pretty good morning, playing with Carolynn, eating (staying steady at her weight from the previous week.) Followed up by a nice healthy nap. Apparently Chemo dries up the skin. We lotion Gabby up on a daily basis. However as quick as we do her skin dries right back out, especially her feet. Lately when Gabby wants to move she just does. She doesn’t understand at all times that she just can’t get up and walk away. She was at the table playing a game with Carolynn, and stood up to walk away. Carolynn had her by her gate belt but Gabby’s feet slid right out from her. She isn’t able to move her left arm quick enough to cushion any falls, so when she went down she landed on the left side of her face. Carolynn sat her down and within a few minutes she started to vomit. With a healthy child if this happens and you call the hospital they most likely would say “ just watch her overnight”, however with a child with Gabbys diagnosis the Oncology Clinic said get her to the ER. So we fought Friday afternoon traffic on the Schyulkill to get to CHOP’s ER and spent the next 6-7 hours there. We were actually told it was better that she fell on her face as opposed to the back of her head due to the condition of her brain. Something I would never have imagined ever hearing 2 months ago. They gave her a CT scan and there were no facial fractures. Just a bruise, small cut and one heck of a shiner the next day. Seriously I don’t know how much can be thrown at this little girl. She keeps going because what other choice is there. When this started we were told 30 treatments of Radiation and 42 doses of Chemo. There was no other plan talked about afterwards. We had to start somewhere and that’s just what we did. Over the last few weeks many people have suggested neuro surgeons that can help. The problem is, Gabby’s Tumor, Mass or whatever other scary name you would like to give it can not be removed. So what does that mean? I have used the word Believe, and will continue to use it. We believe she will get better, we believe she will beat this. When we had our big meeting and they gave us the diagnosis and started giving us timelines, survival % based on months and years, we believe we were also told a small percentage can survive. We believe it was 1-3%. Trying to look back I’m not sure where I heard that or if that was the exact number. But who cares? Numbers are numbers, they can’t help us with this, so why bother remembering them. We believe she will go on, survive, get well. Recently I read a post from a new friend, another little child lost their battle and passed on a week after going home. They were told the treatment was no longer working. I hadn’t thought about this until this morning at4:30 a.m. I laid there thinking how strong that little boy was, how brave, how much love his parents must have gave him. This is all so horrible, for the children, for the parents for everyone that loved or knew him. I can’t imagine what they went through, and my heart goes out to them as well as every prayer I can manage. 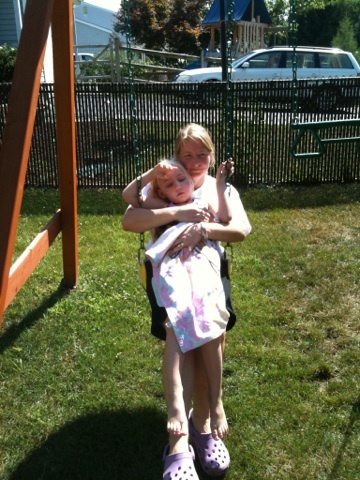 When Gabby is done radiation she gets four weeks off. No prodding, no ouchies, hopefully no visits to CHOP. 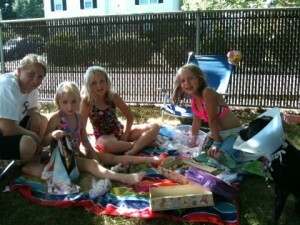 We are trying to plan a week to the beach somewhere close or a trip to The Great Wolf lodge. 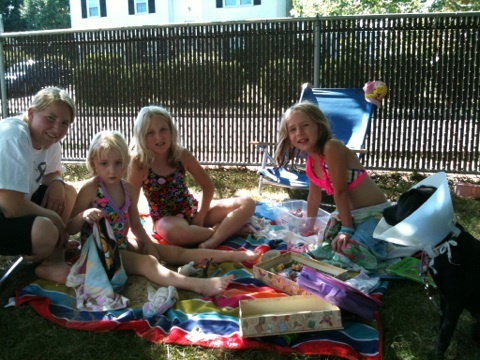 We want her to enjoy the summer like she has on the summer beach trips for the last five years. However as soon as these treatments stop another timer starts ticking. We wait four weeks and do another scan to see if treatment worked. Did it to slow this monster down, did it get rid of the cancer cells? So what are we praying for? Obviously we want the doctor to come in and go” I have no idea what happened but it’s gone”. Things like this happen , we don’t know why but they do. The thing that keeps us up at night, is what if they don’t say it’s gone? Then we start Chemo again. She can’t be given radiation again. That means we keep giving her this “medicine” trying to kill the cells that are dividing in her brain. There haven’t been any major breakthroughs with DIPG in over 30 years. I talked to another doctor inTexasand he explained treatment for this hasn’t changed since the 1980’s. Neither have the percentages. Just because they haven’t changed doesn’t mean that tomorrow they won’t or a doctor inCaliforniawon’t come up with something in two years. What we need to do is be strong for Gabby, help her keep fighting this battle until they have a cure or we get that miracle. I sat in bed and doubt crept in, then fear, then the tears. Life not only won’t be the same but now we all live with the fear of hearing a doctor say” it’s not working anymore”. As hard as it is to type that, it’s still vital that we believe we won’t hear it. She will wake up tomorrow and we will be with her, this will keep going till we get our miracle, a cure is found. Someone recently asked me would I tell Gabby the severity of what she is going through? I can’t imagine how that would help, how a five year old could comprehend it and more importantly why she needs to know now. All she keeps saying is that when she is six she will no longer be sick. And if she is we cross that bridge when we get to it. If you disagree and you have a healthy five year old let me ask you the same question, would you tell them there is a chance they could die? Two months ago she was making fart jokes with her sisters and now people are asking if I want to have life and death conversations with her. Sorry I’m going to pass on that one. We were stuck at clinic longer than expected this past week. No one could let the dog out. Carolynn told Gabby the dog would have her legs crossed when we got home. Gabby looked at her and said “Mom dog’s can’t cross their legs”. We were all telling jokes at the dinner table, knock-knock jokes. I being the gross dad asked “what’s green and red and spins round and round? A frog in a blender.” My nine and seven year old got it. Gabby looked at me and said “I don’t get it” I didn’t explain. We all went to see Winnie the Pooh. Carolynn basically wiped down the whole theater with sanitizer and followed it up with putting a sheet over Gabs seat. Gabby ate ice cream, popcorn and candy. She was just loving life. There really isn’t a plan. Gabby still goes to Physical and Occupational Therapy daily and if she doesn’t she does it at home with Carolynn, her sisters, and I. We will get her through the next five treatments, she will get herself through them. Then we will try to have a vacation, away from the nightmare, away from the monster. After that we come home and see where we are. We are told don’t plan too far in advance, the percentages are there. But again what good are they? Belief, Faith, and Hope, those are the words that have meaning in our lives. So we started talking about Disney in October over her birthday. The last time we went, Gabby turned one while we were there. She doesn’t remember any of the vacation. I’m sure you all know she is fixated by the princesses. We heard Disney in October during Halloween is fantastic. It will be her birthday, she will be six, and she won’t be sick. Taking Gabby to Disney World in October would be wonderful for her. I sure hope you make sure to get special treatment while there. I’m sure Disney would be happy to help your family have a fantastic time. You can have breakfast with the Princesses!!! I know you can get special passes so you don’t have to stand in lines. You just need to contact the right people and make arrangements. Good luck with the plan. Praying for Gabby and hope she gets her miracle!! You guys are amazing!!! I can’t imagine the pain you go through daily, I know I don’t stop thinking about you guys…Wish I could help take it all away!!! 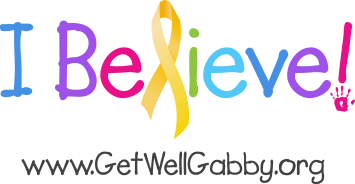 As parents you are doing the best for Gabby – why make her life miserable with knowing what is a possibility…why make her think about that when we know she’s going to beat this? It can and will happen, we just have to believe! I know my brother didn’t have the same yuckies Gabby had, but he had the same percentages, same possibilities, and the same treatments…I’ve seen the vomiting, I’ve seen the hair loss, I’ve seen other kids around him lose the fight…I’ve seen the days when we were in doubt…Through it all we had to remember to stay strong for him…you have to remember to stay strong for GABBY!!! Keep her spirits up so she can keep the strength to fight!!! We BELIEVE!!!! When you mentioned that you wanted the doctor to say that the cancer was gone, Believe, I was listening to K-love radio this morning and someone called in and that was exactly what happened was that the doctors expected Him to get worse and then the next day It was gone completely. So I know that could very well happen for Gabby, You guys are a big inspiration I will continue to pray for Gabby and Believe!! God has a plan. I have a five year old and there’s no way that I would explain the big picture of what’s going on. I completely agree with your approach.